Divorce figures are at an all time high. In this provocative book Vanessa Lloyd Platt ponders who is to blame for this. Is it women who fail to balance work and home, turning it into a battle-ground, or men, who fail to help at home or communicate effectively? 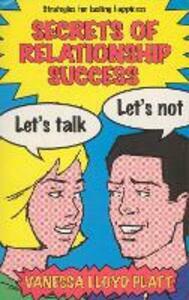 With quotes and anecdotes from both men and women Secrets of Relationship Success suggests how to reverse the bad habits which can destroy relationships, and provides tips and strategies for coping with adultery, stress, men's childishness and violence. By spotlighting these repeated behaviour patterns, Vanessa Lloyd Platt believes that relationships can be saved and set on the right path to lasting happiness.